Anyone who thinks ecological awareness and luxury are mutually exclusive has a lesson to learn at Coconut Lagoon, a resort in India's magical province of Kerala. 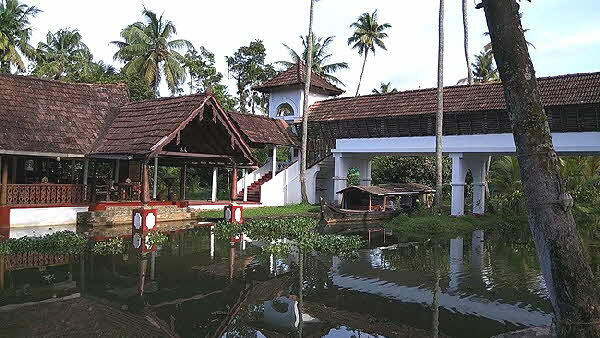 Just two hours drive southeast from the historic seaport of Cochin, the hotel is a "village" of authentic traditional homes perched on the shore of India's longest lake, Vembanad. 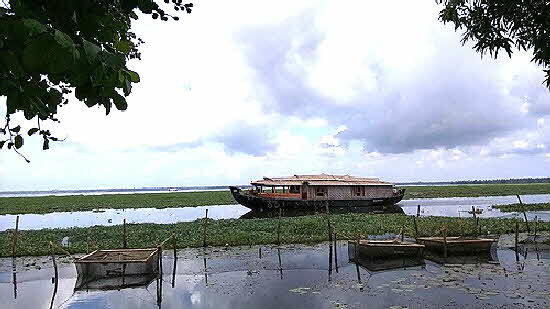 A charming wooden boat meets guests at the jetty and floats them down the canal lined with bamboo houseboats past residents catching fish and washing clothes along the banks. 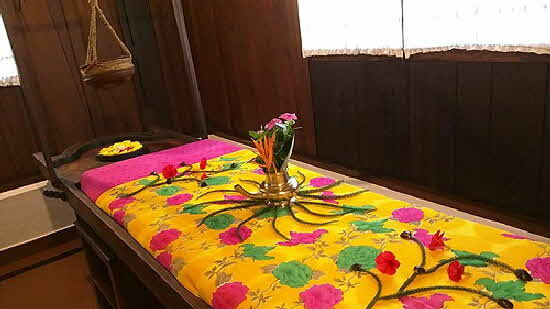 With a flautist piping reedy strains, disembarking guests are presented orange marigold flowers, refreshing towels, and coconut drinks before dispersing to their bungalows. 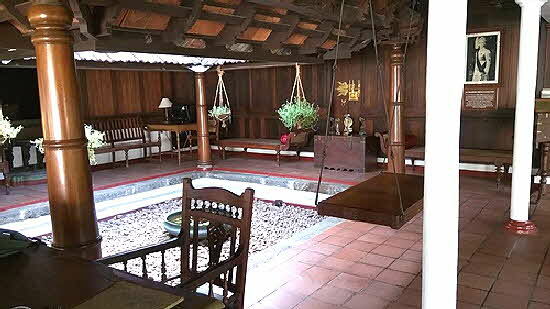 Each structure is built in traditional style, many of them historical homes that were dismantled, brought here, reassembled, and updated for guests. Besides featuring authentic dark wood trim, louvered window shutters, elaborately carved ceilings, pristine white walls, the bungalows have outdoor bathrooms with the sheltered shower, sink, and toilet surrounding a gravel terrace and green plant growing under the open sky. Herbal scented toiletries and amenities are provided in charming ceramic bottles. Free wi-fi is available round the clock. 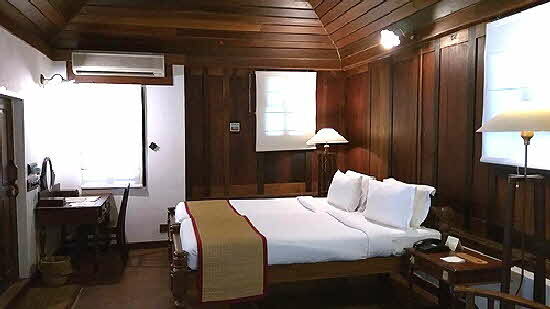 Besides air conditioning, an overhead fan circulates air over the classic wooden bed with immaculate sheets and pillows.Â Several outlets at the desk provide power for the free wi-fi. The mini bar contains $3 packets of cashews, $5 beer and $12 mini-bottles of Indian wine. Rattan slippers, white cotton robes, and a safe are concealed in the built-in wooden armoire. Fifty rooms include standard Heritage Bungalows, larger Heritage Mansions which accommodate groups with up to four bedrooms.Â Pool Villas, (Paul McCartney and Heather Mills honeymooned in one) are lakefront bungalows which include sitting and dining areas, private outdoor pools, and open-air back balconies where guests can relax while enjoying views of the bright green rice paddy beyond, alive with insects, birds, and fishes. And viewing wildlife is one of the resort's attractions. Guests on early morning bird watching excursions with the resident naturalist catch glimpses of kingfishers soaring overhead and cormorants preening their feathers.Â In special preserves planted with the favorite bushes and flowers of each species, butterflies and dragonflies dart and flutter about as guests stroll by. 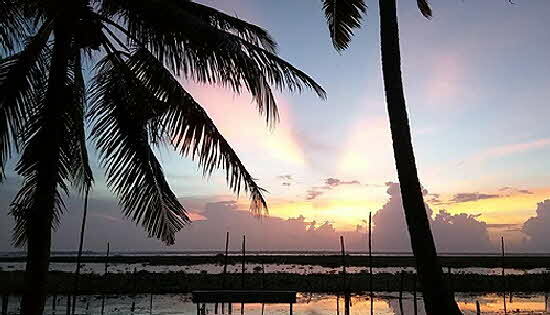 Fish are bred in rectangular nets lining the shore, and coconut shells strapped to the trees serve as planters for decorative orchids. The whole 30 acres is interspersed with canals interlaced with arched bridges and from morning to night bamboo houseboats and fishermen in canoes glide silently by. 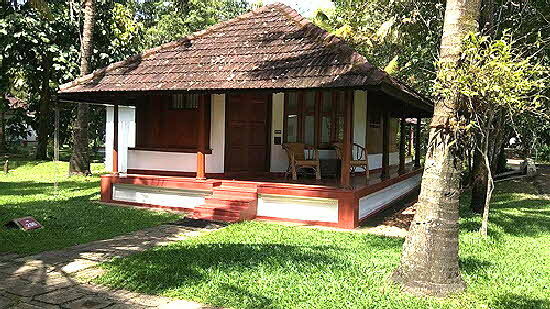 At one end of the property is the waterside Ayurveda spa. 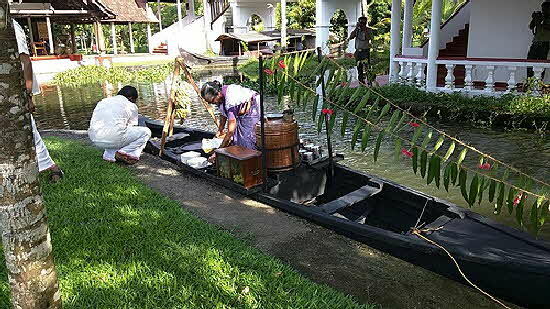 Attendants clad in the hotel's gold trimmed white sari "uniforms" don gingham aprons to administer massage. After Dr. Blossom takes your blood pressure, you lie on a bright colored mattress while hot oil is dripped down your body. Then in a "spa des deux" two attendants massage you simultaneously and symmetrically up and down your body. From there you are escorted to a wooden steam box where you're enclosed from the neck down to sit for fifteen minutes with steam swirling around your lower body. Finally you are escorted to the outdoor shower and scrubbed with a powder paste to remove the oil leaving your skin lusciously soft and shiny. For guests who want more than pampering and relaxing beside the bright clear water of the scalloped swimming pool, there is a full range of daily activities. Early morning yoga sessions are held in the tranquil screened villa on the edge of the paddy where birdsongs and the splashes of fishermen accompany the yogi's instructions. Walks with the naturalist illuminate local plants and wildlife. At the shop, instructors demonstrate how to tie on a sari and wrap the men's diaper-like dhoti. 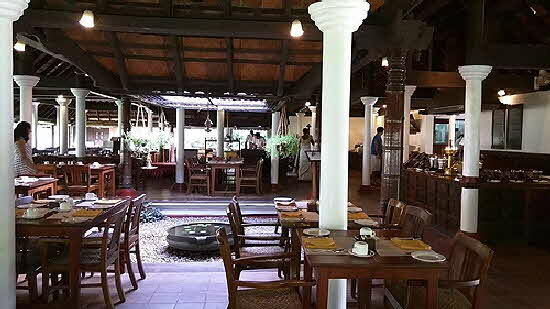 The intricacies of Kerala's cuisine are demonstrated in cooking classes conducted by the chefs. Every evening night-meal is preceded by a cultural presentation. Beautiful dancers in saris sway gracefully or in the traditional Thullal dance an astounding dancer uses gestures and facial expressions including undulating eyebrows to tell traditional stories. The resort is one of 17 operated by the CGH group -- the initials standing for Clean, Green, Healthy. Composting, recycling, waste management -- every effort is made to live in harmony with nature. Rainwater is collected and purified. Cow dung is converted to methane gas which the chefs use for cooking. Signs in the bathroom remind guests that running the water for five minutes while brushing your teeth can waste 44 liters of water per day. Mosquito control is natural -- nightly circulation of the canal water augmented by the appetites of birds and fishes on the premises. Media-starved guests can watch television on a lounge near the fitness room, but each bungalow is TV-free, inviting guests to fully experience the lush, tropical natural world.